These stylish Tory Burch wedges are a staple item for anyone’s wardrobe. Wear with skinny jeans or pretty dresses with a leather biker jacket. Team with this season’s must have black leather pencil skirt with a tucked in fitted tee or blouse. 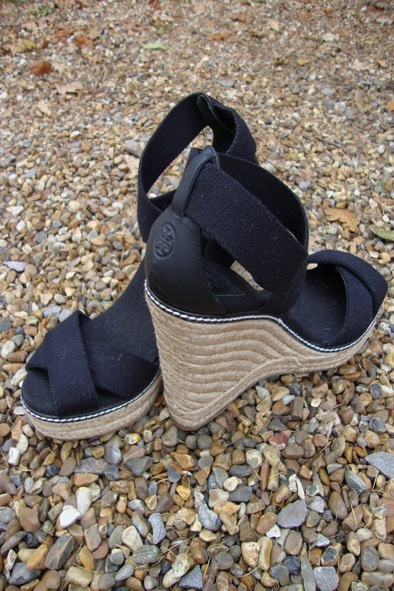 The wedges are new without their box and they are a 9 US / 6 UK. They have a rubber sole and a black leather heel embossed with TB emblem. There is contrasting white stitching detail around the sole of the shoe. The heel measures 4.5 inches high and there is a subtle 1 inch wedge at the front which makes the shoe feel less high to wear. They are a style steal at £95!